The NFL’s as-yet-unabridged preseason finished up last weekend, and the Detroit Lions turned in another dominant performance, posting a 4-0 record and notching an especially impressive win over the New England Patriots. Analysts and commentators repeat the common mantra that the preseason doesn’t mean a lot, but in the same breath, many of them are pointing to this year’s Lions as a team that could be a surprise success. While it’s hard to see any strong statistical correlations between performance in the presesason and regular season– mostly because the team has been consistently bad in the regular season and bad overall– a few observations are possible. The most obvious one is that the last time Detroit went 4-0 in the preseason was 2008, a historically bad year in which the Lions became the only team to go winless in a 16-game NFL regular season, also therefore setting the record for most losses in a single season. 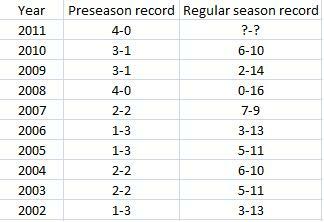 Moreover, they won more preseason games (10) than regular season games (8) over the last three years. What to make of this? The Lions haven’t been above .500 since 2000, when they were 9-7 (2-2 in the preseason), and they haven’t been to the playoffs since 1999, the year after Barry Sanders abruptly retired, so it’s tough to believe the popular predictions of greatness this year. It does feel like a lot more pieces (on the field and sidelines, and in the front office) of a winning team are in place this year, but many fundamental ifs remain for a team playing in the same division as the defending world champions. Predicting which Lions team– the successful preseason version or the perennially disappointing regular-season version– will show up this year may be even more difficult than predicting which Eddie Murphy will show up to host the 2012 Oscars. This entry was posted in ALDLAND and tagged detroit, eddie murphy, football, lions, nfl by AD. Bookmark the permalink.